Are QED HDMI cables 2.0 compatible? All existing QED HDMI cables are already compatible with the HDMI 2.0 standard and carry the "High Speed with Ethernet" logo and 3D/4K logos to prove it. Discover what Airloc is, and how it plays a vital part in cable design. What is QED Bandpass Filter Technology? Learn about Bandpass Filter Technology and get a better understanding of what it can do for you. Why choose QED Cat6 Cables? Find out about all of the information that you need for CAT6 cables. What make our Audio 40 cables so special? Discover from the inside out, the secrets behind the award winning range. When installing structured wiring for Ethernet you want to be certain that the physical layer can accommodate the currently required network standard plus any upgrades that might be needed in the future. The most common standards encountered today in office or domestic environments are 10BaseT, 100BaseT and 1000BaseT which run at speeds of 10Mb/s, 100Mb/s and 1000Mb/s respectively. 1000BaseT is commonly referred to as Gigabit Ethernet and is the standard of choice for most modern installations. Gigabit Ethernet requires CAT5 cable or better. Consisting of four twisted copper pairs it must be capable of carrying the 125MHz base band frequency required to transmit 1Gb/s across the four data lanes over a maximum length of 100m; this is about the limit for CAT5e so in many installations CAT6 is used to ensure accurate transmission up to 100m. In recent years an even faster standard called 10GBaseT has been introduced into more and more installations. This standard enables networks to carry up to 10Gb/s over standard four pair wiring using a base band frequency of 500MHz but in order to achieve this over 100m an enhanced and expensive cable structure is required in the form of CAT6a - however ordinary CAT6 cable can cope with the increased speed but only up to a maximum length of 55m. Increasingly cables are being marketed as "CAT6 550" or "CAT6e" - neither of which is an official cable designation. These are really just ordinary CAT6 cables and cannot be recommended for 10GBaseT installations because they will not work over more than 55m. QED Pro CAT6 cable is no different in this respect, but importantly we do not claim that our CAT6 cable is certified for 550MHz. Although we do not make exaggerated claims for our CAT6 cable it is still superior to many that are dubbed CAT6 550 or CAT6e. In order to be certified for use in a network, cables must pass all the tests described in the international standards TIA-568-B & ISO 11801:2002. There are various parameters that have to be tested but the most pertinent of these is called ACR or "attenuation crosstalk ratio". This is a measure of how intelligible the signal remains at the receiving end of each twisted pair after being sent down the entire length of the cable. For the information to be entirely free of errors this measure must be at least 8dB. 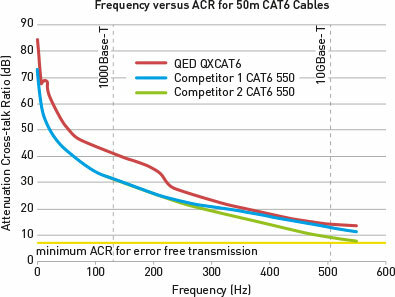 The graph shows how at every frequency a 50m QED Pro CAT6 cable outperforms two competitor cables that claim to be 550MHz certified even though we make no such exaggerated claims for our cable. At the reduced length of 50m ordinary CAT6 cables can be used for 10GBaseT, however even with the superior performance of QED Pro CAT6 it is important that the installer ensures they do not exceed this advised maximum length during installation.